ALTON, IL (KTRK) -- A police officer will be investigated after an incident caught on camera in January at police headquarters in Alton, Illinois. 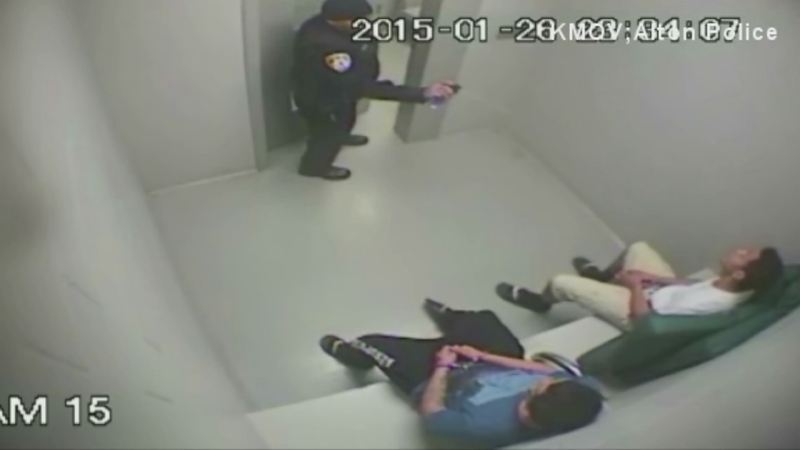 An officer is seen apparently using pepper spray on two teenagers handcuffed inside a holding cell. One of the teens is seen twitching and shaking after being sprayed. So far, as KMOV reports, no action has been taken against the police officer involved. Alton Police Chief Jason Simmons said Tuesday he was "holding off on any judgment" until he received the report from the officer who reported it to him back in March. The report wasn't finished until May 6. Simmons said, "We will start an investigation and we will interview the officer but I'm withholding any information right now as far as punishment until a thorough investigation is complete." The video has also been turned over to the Illinois State Police. KMOV reports residents say they see this is indicative of problems with their police department. Alton resident Marcus Gordon told KMOV, "I fear for my son's life because the police out here, they are out of control. There's nobody controlling or regulating what they are doing."